This is our own family condo, very clean and cozy. 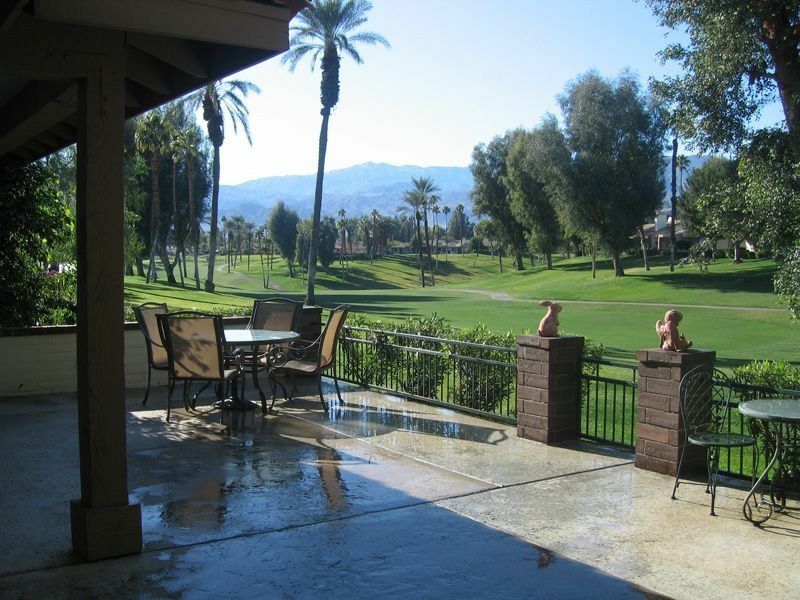 Located in Palm Desert, in the gated community of Monterey Country Club. 36 pools and spas, 19 tennis courts, fitness center and a newly remodeled clubhouse and restaurant. Let's not forget 27 holes of Championship GOLF. Take advantage of the Month to Month ALL INCLUSIVE GOLF, TENNIS and FITNESS. Private Courtyard Entry, 2 car attached garage. Gorgeous Single Story 3 bedroom 2 baths on the fairway of the south course. Fully furnished enclosed over sized Patio with Gas BBQ, stunning WEST facing mountain views in the background. Quality furnished in great shape. Beautiful clubhouse with gourmet food. Just 2 minutes from the famous El Paseo and 'River' shopping malls. Everything you want to do while out here is within minutes from this centrally located Palm Desert location. Golf, fitness and tennis available to all tenants. -West facing unit for afternoon sun enjoyment. -1 minute to the McCullum Theatre. Keywords: 3 bedroom 2 bath condo on the golf course. Best location in the Coachella valley, out of the wind belt and close to absolutely everything you can imagine. Clean, comfortable west facing condo. My wife and I so enjoyed our time at Philip’s condo we signed up for 3 months next year. The condo has comfortable furniture, 3 new TV’s, well equipped kitchen,and a great patio with a knockout west view. When we arrived we found a clean condo just as promised. Philip is great to work with and immediately returns any emails or calls. He plans even more improvements to keep updating this well maintained condo. Also included are multiple bicycles, fun stuff for the 2 nearby pools and a very handy golf cart. And they do consider pets. Highly recommend this inviting condo. Very nice home, but too dark. There aren't enough lamps in the rooms. We liked the location of the property, proximity to El Paseo, and the privacy. It was great for taking walks and bike rides through the community. All the rooms were a good size, and we liked the back patio. The overall condition of the condo was clean but dated. The Kitchen appliances should be updated along with the bedding. The patio area was dirty, which i cleaned, along with the barbecue, which i didn't use or clean. The blinds in the right side guest bedroom were broken and I could not open them. The patio door screen is missing a wheel on the bottom of the door and would come off the track if care wasn't taken when opening and closing. I did enjoy the condo's location and proximity to pools, it was easy to keep track of the grandchildren when they visited. The owner was attentive although I tried not to bother them with trivial items. Had a delightful month"s stay at Monterey. This was the fourth year with the owner's property. The rental is always clean, serviceable and ready for use. Nicely appointed and spacious it provides a comfortable retreat. Monterey County Club has many ammenites including two golf courses, tennis, swimming pools throughout the complex and it is in the center of Palm Desert with short drives to restaurants, El Paseo shopping and stores. This rental was sold to us as having a king, queen and twin beds in the 3 bedrooms, but when we arrived there were 3 queens. Given that we filter out rentals that don't have a king bed, we wouldn't have stayed here if the owner had told us he changed the beds to queens. To make it worse, he didn't update the bedding, so we were using the old king sheets on the master queen. These kind of matched the majority of the towels that were frayed or stained; we had to buy our own face cloths. The brand new kitchen appliances were actually 10 years old and of lower quality; the dishwasher was pretty much useless. The property doesn't sleep 8; there are 3 queens and no convertible beds. The dining table is big enough for 6 but there are only 4 chairs. There is no stereo or DVD player. The breakfast nook (now not advertised) was not there. There were bikes, but all had flat tires and only 1 was actually functional. There is a $50 penalty against the renter for not cleaning the BBQ or replacing an empty propane bottle. The spare was empty to start so we had to exchange it before running out of the one in use. It took about an hour to clean the grease and dirt off it so the store would be willing to take it back. The bottle on the BBQ also had to be cleaned as it too was coated with grease and dirt because there wasn't a proper catch tray in place until we got one. The owner should be paying us the $50. The condo is 35 years old and needs some renovating. Even in its current condition it needs a deep cleaning and de-clutter. Friends were staying at another VRBO property in the same complex and paying less for their month than we did, even though their place was fully updated and far superior (except for the deck). On the positive side our rental had a nice, well equipped, deck with a golf course outlook and western exposure. Inside, there was new living and bedroom furniture, and a number of new items such as the pots and pans. Desert Trip Weekend 1 with the girls! Beautiful, spacious home. Very comfortable. We highly recommend mimosas on the patio while looking out at the gorgeous golf course. The owners were very thoughtful and responsive. Golf,Tennis and gym is available to all tenants for a fee.